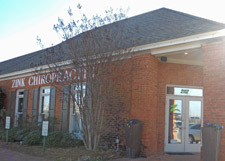 Welcome to Zink Chiropractic and Wellness Center! We are located on Taylor Road, exit 9 from I-85. Driving South on Taylor Road towards Vaughn Road, you will pass East Chase Mall and we are located on the left past Buddy Watson Ballpark. Coming from Vaughn Road you will go North on Taylor Road. We are past Regions Bank on the right before you get to Buddy Watson Ballpark.